Ads that automatically redirect you from your daily browsing to a flashy sweepstakes have long been an incredibly annoying facet of the internet. But the versions that have evolved on the mobile web are particularly vexing, because they can trap you with a pop-up “notification” and nowhere to go. And a recent surge in these mobile pop-ups, even on reputable sites, has left people more frustrated than ever. Internet advertising firms are losing hundreds of millions of dollars following the introduction of a new privacy feature from Apple that prevents users from being tracked around the web. Advertising technology firm Criteo, one of the largest in the industry, says that the Intelligent Tracking Prevention (ITP) feature for Safari, which holds 15% of the global browser market, is likely to cut its 2018 revenue by more than a fifth compared to projections made before ITP was announced. These are two separate but related issues. The push back against online advertising arose because of how readers were being abused with privacy violations, and by ads that destroyed the browsing experience. What did these advertisers expect? WordPress Theme Developer to Use Code to Start Tracking All Sites Running Its Themes. Yikes! Almost two years ago, I wrote about the positive experience that I’d had with WooThemes when switching over to the current WordPress theme that powers 40Tech. I implemented several custom changes to the theme we use here, and the WooThemes folks were very helpful as I worked things out. Lately, though, the WooThemes team has taken a step that has given me pause. Specifically, WooThemes is integrating tracking into all of their themes – new or old – so that they can get a better idea of how their customers are using their themes. When we first told you about Hotspot Shield, it was to use the free Virtual Private Network to bypass blocked media, as well as increase your browsing security. Over a year later, we posted a tutorial on how to use the VPN to watch US Netflix outside of United States, using your iOS devices. Unfortunately, the Hotspot Shield sign up process for iOS was broken soonafter, and their customer service team didn’t have a lot to say about it. 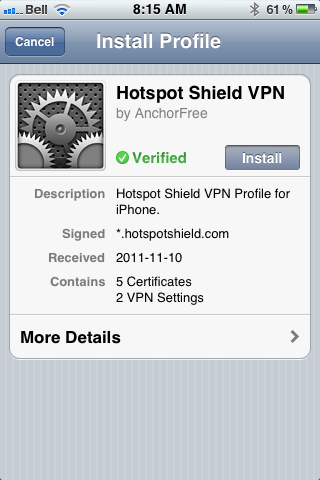 Now we know why: Anchorfree, the creators of Hotspot Shield have released an iPhone app that makes all of the steps go away, and even solves a few of the problems. The new Hotspot Shield app will have you up and running with a couple of touches, installing two VPN configurations on your iPhone or iPad. The second one is for manual use — you turn it on when you need it, and leave it off when you don’t. The default configuration, though, is Always On, which handily accomplishes two things: it allows you to automatically have the VPN’s data compression and additional security in place whether you are on WiFi or mobile broadband, and it also fixes potential annoyances by automatically re-establishing the VPN’s connection when it drops (which is still a regular occurrence). In testing, I found that the VPN is more stable on iOS than it was previously, and that using it was practically painless. I also discovered, very quickly, that the free-ness of Hotspot Shield — at least for mobile — is a thing of the past. In comparison to other VPNs, though, especially services that are as effective, the price is still more than worthwhile. You can use the VPN free for a week, after that, it’ll cost you $0.99/month or $9.99/year. You can also use a purchase code the app provides you to activate up to five personal devices that are connected to the same iTunes account. If the incredibly attractive price is to much for you, and you already have an old Hotspot Shield VPN installed on your iOS device, it should still work, at least for now — mine does, anyway. Some other fun features of the app are the abilities to track your bandwidth savings and to control your compression level. You can turn it off completely for WiFi, or turn it up to maximum to save bandwidth on images and the like. This will downgrade image quality, of course, but how much is your data worth to you? The terms of service are very explicit about the VPN being for personal use only. Don’t use it for business or they may cut you off. 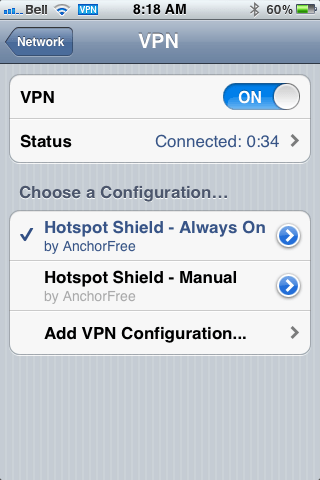 What do you think of Hotspot Shield for iOS? Do you plan to use it to increase your browsing security? Let us know in the comments! We once pondered whether Google was the devil. One of the issues that we raised was one of privacy. If you’re worried that Google is tracking your searches by cookie ID or by IP address, you have some options to thwart Google. One of those options is Scroogle. 9/28/2011 UPDATE: Facebook has responded to the complaints . . . sort of. For an in depth explanation of Facebook’s response, check out Nik Cubrilovic’s blog post. Facebook has some explaining to do, if the findings of one blogger are true. Nik Cubrilovic, an entrepreneur and developer, recently analyzed Facebook’s tracking cookies, and found some surprising behavior. Specifically, even if you log out of your Facebook account, “Facebook still knows and can track every page you visit.” Before you get too upset, though, read on.